When most of us think of Thanksgiving, we think of the Pilgrims. Hats with buckles, Squanto, baskets of maize, and, of course, the Mayflower. 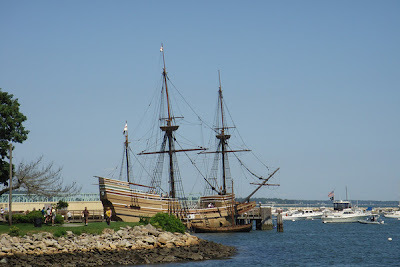 One of the best historic sites in America is the Mayflower II and Plimouth Plantation (located a few miles apart) in Plymouth, Massachusetts. The Thanksgiving story depicted in elementary school textbooks and portrayed commercially is often quite different from what historic texts reveal about this famous story. A more accurate representation found at these sites is both humbling and enlightening and will change the way you look at the founding of our country. Many Americans (including myself) often imagine colonial America closer to how it was in 1776 and fail to realize how truly primitive the original colonists lived in the early 1600s. A common reaction when people first see the Mayflower II (an exact replica of the original ship) is how small the ship actually was. How could it possibly cross the Atlantic or hold well over 100 people (roughly 102 passengers and another 25 or so in crew)? Entire families travelled then lived for months in spaces smaller than an office cubicle. We herded our family of then 4 kids into a flimsy three sided space and realized that everyone could not lay down simultaneously because it was so small. While changing a simple diaper on the tour, I realized how horrific the sanitary conditions would have been, how quickly germs would spread, and the abundance of mice and bugs. Because the ship landed in November, crew and passengers lived on the tiny ship during the long winter spreading disease among each other until half had died. Another amazing part of the tour is the scientific instruments and maps of the era. The crude compass that failed briefly in the middle of the ocean. Maps developed largely by fisherman that depict somewhat accurately most of the American coastline and almost nothing of the interior. The intricate pulley systems used in the sails and to transport cargo. Historians often debate whether the ship intentionally sailed "off-course" to Cape Cod rather than its original destination of Virginia or did the ship truly get lost in the storms. After seeing such crude instruments, the latter seems highly probable (though this historian is still a little skeptical). You begin to wonder why anyone would have actually signed up for such a voyage. The textbooks tell us of religious freedom but less than half the passengers were actually Pilgrims seeking religious freedom and none of the crew were. Actors depict actual people from the time and often site adventure and lack of opportunities in Europe as reasons for going on such a perilous voyage. This is a great opportunity to ask questions about period clothing, diet, perils of the first winter, weapons of the era, the varied occupations of the passengers, etc. There are also plenty of hands-on activities for the children with period costumes to try on, corners of the ship to explore, and interactive exhibits. 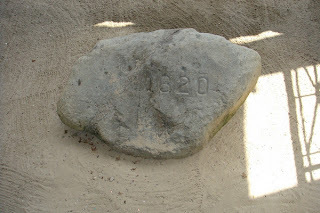 The Plymouth Rock is also located next to the ship with the date 1620 clearly carved to symbolize where the Mayflower landed. This rock, which is largely legend, has been iconic in America since the mid-1700s and has been protected and displayed on the beach for almost 100 years. The area is a coastal park with picnic tables and is a great place for your children to play after their extensive history lesson. School aged and younger children will be unable to comprehend how small this ship actually is, how primitive the maps are, what it means to half the population die, to imagine living with 100 people. To them, the ship is an exciting adventure to explore, like camping. Don't be surprised if your sons shouts pirate command while standing on deck or your daughter talks endless about the costumes. Having fun at historical places and at museums is fabulous. And though they may not fully understand everything now, this can be extremely educational to adults and teens and makes history come alive to younger children. If you have a chance to visit the Mayflower, you will leave with a profound wonder of how any of the early colonists could have successfully navigated the ocean and survived aboard for eight long months. And if you are lucky enough to have a Mayflower ancestor, you will be even more inspired by the trip. WOW this brings back Memories..... We were there I think back in 1998!! So thanks for this! You don't get to step back into 1620 everyday. Glad you liked it.